Individual Events First Prize: Each of eleven (11) Individual Event First Prize winners will receive a $2,500 Bass Pro Shop Gift Card. If an Individual Events First Prize winner is a B.A.S.S. Member as of each Individual Event “Lockdown” date, as indicated in the chart above, he/she will receive an additional $500 Bass Pro Shop Gift Card. Total MAXIMUM ARV of each Individual Event First Prize is $3,000. Grand Prize (top Season total): One (1) Grand Prize Winner will receive a 2019 NITRO Z18 with Mercury 175 ProXS (ARV: $32,635). If Grand Prize winner is a B.A.S.S. member as of 9/26/19, he/she will receive an additional $500 Bass Pro Shop Gift Card. Total MAXIMUM ARV of Elite Series Grand Prize is $33,135. ARV is as of date of drafting these Official Rules. The difference in value of Grand Prize as stated herein and value at time of prize notification or awarding, if any, will not be awarded. 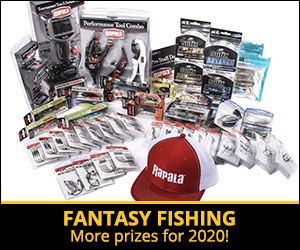 The Grand Prize package (excluding the Bass Pro Shop Gift Card, if applicable) will be awarded in the form of a certificate that can be redeemed at a sponsor-appointed NITRO Boat dealership. Certificate must be redeemed in-person. Certificate is not redeemable for cash. The Grand Prize winner will be responsible for pick-up of the 2019 NITRO Z18 with Mercury 175 ProXS (the “Boat”) at an authorized NITRO Dealer located nearest the Grand Prize winner’s residence as determined by the Sponsor in its sole discretion. Boat will be available with standard equipment; any upgrades and options are at the sole expense of the Grand Prize winner. Color, package, factory options, and other prize specifics to be determined by Sponsor in its sole discretion and are subject to availability. Grand Prize winner will be responsible for all of the following and their related costs: optional equipment; freight and dealer prep fees; title; license; insurance; and registration fees required in claiming the Grand Prize; applicable taxes; as well as all other expenses relating to the receipt and use of Grand Prize, including any travel and transportation costs associated with collecting the Grand Prize. All other costs not specifically stated herein as being awarded are the responsibility of the Grand Prize winner. Grand Prize winner will be responsible for transporting the Boat from dealership. Winner must personally retrieve the Boat within 30 days of written notification of delivery. Grand Prize winner may need to provide a valid U.S. Driver’s License and proof of Insurance Coverage or any other required documentation requested by the dealer and/or manufacturer. Grand Prize winner may need insurance prior to taking receipt of the Grand Prize. Sales tax may vary from state to state and is the responsibility of the Grand Prize winner, not the Sponsor, the manufacturers or dealers or any of their respective parents, affiliates, subsidiaries and successor companies, and their respective officers, directors, employees, representatives, and agents. ONLY THE NUMBER OF PRIZES SET FORTH IN THESE OFFICIAL RULES WILL BE AWARDED IN THIS PROMOTION. PARTICIPATION IN THIS PROMOTION AND THE RECEIPT AND/OR USE OF ANY PRIZE OFFERED IS AT YOUR OWN RISK. YOU SHOULD NOT ATTEMPT ANY BOATING ACTIVITY THAT IS BEYOND YOUR SKILL LEVEL. ENTRANTS ACKNOWLEDGE THE INHERENT HAZARDS, DANGERS AND RISKS ASSOCIATED WITH BOATING, AND THAT THERE ARE NATURAL FACTORS AND OCCURRENCES WHICH MAY IMPACT ON OR AFFECT THE SAFETY OF SUCH ACTIVITIES, AND ENTRANTS ASSUME THESE RISKS AND DANGERS. Total approximate retail value of all prizes to be awarded: $60,135 Minimum ARV / $66,135 Maximum ARV.